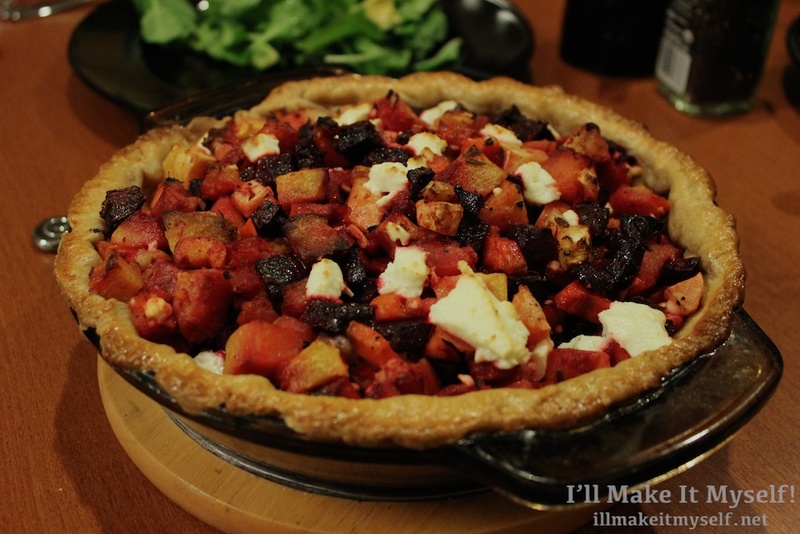 Savory Winter Root Vegetable Tart – I'll Make It Myself! Make the dough first, and then prepare and cook the vegetables during the rest time. Vegetarian. The filling is cow- dairy free; the crust is vegan. 1. Preheat oven to 400º F (200º C). 2. Prepare the pie crust per instructions in link. 3. Peel and dice vegetables as instructed. In a glass baking pan, toss with olive oil, rosemary, salt and pepper. 4. Fold foil into a square “boat” for the garlic, then fill with ~1/2 tsp water. Snip the tip off the clove of garlic and and set in the foil in the middle of the baking pan. 5. Roast for 35 minutes, stirring occasionally, until vegetables are softened and lightly brown and the garlic is soft. 6. Remove the cloves from the head and dice or mash (you may need to wait for it to cool), then mix with the vegetables and 3/4 of the goat cheese. 7. Grease a pie pan, roll out and arrange the dough (1 crust), crimp the edges, and brush with olive oil. 8. Fill the pie crust with the vegetable and cheese mixture, then top with the rest of the goat cheese. Bake till the crust is golden, about 30-35 minutes. Let rest 10 minutes and serve warm. wow, this is just my kind of recipe. I love anything with pastry and I love roasted veg. Sounds delicious.